Being thought of having a romantic relationship, like other showbiz personalities who posted their pictures on their instagram account, the couple Gerald Anderson and Maja Salvador publicized their photos on the said social networking site (IG) on their Holy Week activities. 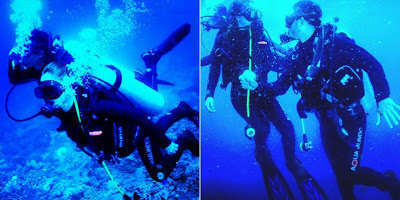 Gerald and Maja enjoyed the scuba diving in an undisclosed place, as Maja did not tell any word about their holiday break. But the couple is still denying that they are already officially in a relationship. It has been said by the “Ina Kapatid Anak” actress that they don’t have formal relationship of the actor. Their friend and kapamilya actor-dancer Rayver Cruz is always their companion on their trips.